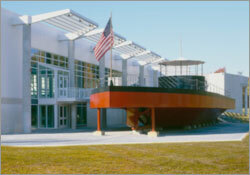 Entrance to the USS Monitor Center at The Mariners' Museum. Photo: Courtesy of The Mariners' Museum. On March 9, 1987, The Mariners' Museum in Newport News, Va., was designated the principle repository for USS Monitor's artifacts and the official visitor center for the Monitor National Marine Sanctuary. The museum acts as the primary conservation facility for artifacts recovered from the site. In 2007, the Batten Conservation Laboratory Complex opened at the museum. This state-of-the-art facility houses thousands of small and large Monitor artifacts where scientists study the corrosion process and preserve components of the shipwreck. In the conservation complex, museum visitors can stand just feet from the turret, steam engine and Dahlgren guns as they watch conservators at work. 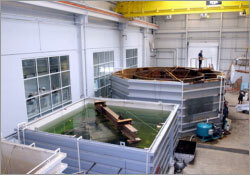 On March 9, 2007, the USS Monitor Center opened to the public. 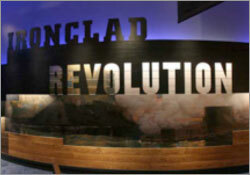 At the heart of the center is the exhibition-Ironclad Revolution-a melding of artifacts, original documents, paintings, personal accounts, interactive exhibits and environments that will pique all five senses. The strategies, people, technology and science behind the historic circumstances surrounding this story are displayed in an extraordinary way. Visit http://www.monitorcenter.org for more information on the conservation and preservation of the USS Monitor and her legacy.